Gloria says "In our yard in Lake Forest Park the other day. Turns out American Robins travel in flocks in the winter and hunt mostly for berries. Had 12 or 15 in our holly bush when I snapped this one." 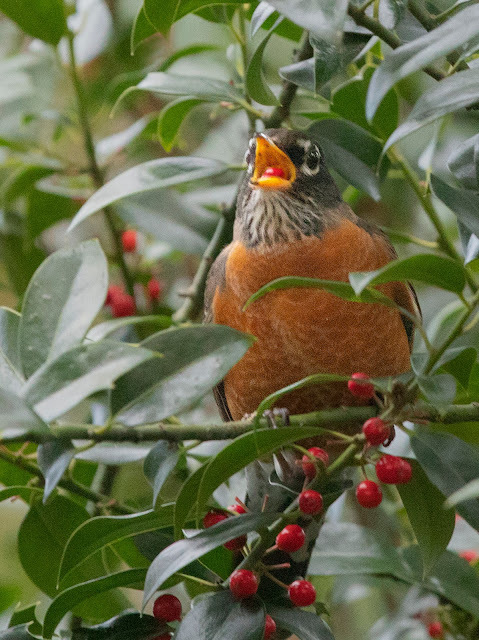 Robins obviously have some superpowers because holly berries are poisonous to people and pets. It does leave more for the robins. I look forward every year to the flock of robins taking one day and eating every berry off the cotoneaster in my Shoreline front yard. They came earlier this week and now there's not a berry to be found!